Japan's biggest gaming phenomenon of 2013 has hit its 1 year mark, and to mark the occasion, I finally utilized one of the more recent added features to the game. In one year, the Japanese browser game known as Kantai Collection (艦隊これくしょん) – aka Kan Colle (艦これ) – has amassed over 1.9 million users, or "admirals." 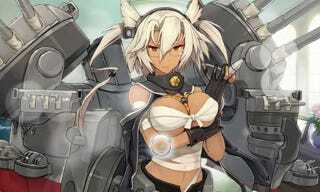 To celebrate, the developers have overhauled the game's UI and added a temporary event map with added anime girl battleships – called "fleet girls" – and equipment items. I figured now is as good a time as any to make use of the "Marriage (virtual)" (ケッコンカッコカリ) system that had been added a couple of months ago as part of the Valentine's system update. How the system works is that after completing a series of quests, players can obtain an item called "marriage papers & wedding ring." This item can be used on any level 99 fleet girl to marry (virtual) her. It sounds kinda corny, but "marrying (virtual)" a fleet girl unlocks the ability to level up beyond the level limit of 99 up to 150, as well as an added bonus to the fleet girl's durability and luck stats. Marrying (virtual) also decreases that fleet girl's fuel and ammunition consumption by 15% – a godsend for resource-guzzling battleships. I'd obtained the marriage (virtual) item shortly after the last system update, but hadn't used it. Now, with the anniversary of the game rolling around, I decided to use it with my favorite battleship and a fleet girl that took me literally 13 straight hours of gameplay to obtain during last November's Fall event in the Iron Bottom Sound: the second Yamato-class battleship, Musashi. So, yeah, I guess that's my waifu now. The marriage (virtual) item is obtainable only once through standard gameplay, but multiple items can be purchased through the game store. It's a massive strategic advantage and there are no repercussions for infidelity, so if you're willing to pay, it is possible to simultaneously marry (virtual) multiple fleet girls. Kan Colle is currently only available for computers accessing via a Japanese IP address, although there are ways around this. A PS Vita version of the game and an anime adaptation are currently in the works.